2003 Lingerie Silkstone Barbie is known as the #6 Lingerie Fashion Model Silkstone Barbie. She was the last in the Silkstone Lingerie Series. 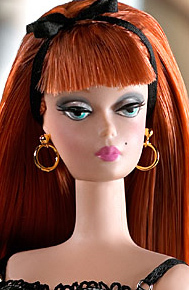 She has long red hair with bangs (she is the only Silkstone Lingerie Barbie with red hair). She also has a black ribbon bow tied in her hair like a headband. She has the same style gold hoop earrings as the other Silkstone Lingerie dolls, which are very much like the ones Barbie originally wore in 1959. She is wearing a short pearl-grey satin slip that is trimmed with black lace. She has sheer black thigh-high stockings and black high-heel shoes with ankle straps.